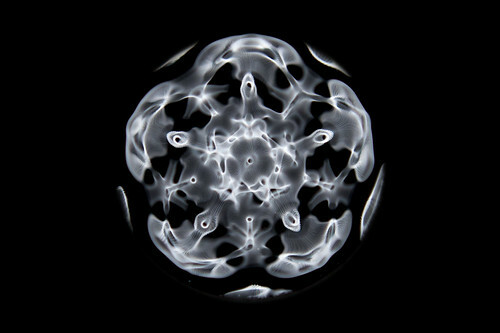 Back to cymatics – sound creates those patterns, but they’re only visible/experienced when the conditions are set up for it. Changing the conditions changes the response, but the patterns are inherent in the sound. We have cultural/personal baggage, and physical phenomena here – as well as layer upon layer of expectation and prior experience – that adds a whole other magnitude of complexity (if not strictly chance/aleatoric, at least sufficiently complex to be largely reliant on serendipity) to the analogy, but the focus on creating safe spaces for response, of encouraging responses but not necessarily directing them (clap here, wave your hands in the air here) could change the way we play music. One of the things I love about doing the improv shows at Tower Of Song in Birmingham is that we get to mess with people’s expectations of what happens in a space like that. The Tower is such a lovely venue, a warm space where music can happen that wouldn’t happen elsewhere, where listening is deeply encouraged. But what’s next? Where do we go with this? Addendum – I’m so deeply grateful to those thinkers and ideas people from so many worlds who mess with my assumptions on a daily basis. The same day I first talked to Annette, I caught up with Pat Kane for the first time in ages, and in 10 minutes he gave me a years’ worth of stuff to ponder and wrestle with. A truly brilliant mind, and one I’m so grateful to get to tap into on occasion. Hello Steve! Thanks for your kind words about The Family Album – interesting analogy with cymatics too… I think it’s always worth thinking of the environment when planning things; as you say, these things are only experienced when the conditions are set up for it. I have more thoughts, but they are slow in forming this morning! Wonderfully provoking! I suppose the Kyma sound design platform is named from Cymatics. Kyma.symbolicsound.com. For decades I’ve envisioned transformative spaces (temples) where participants’ movements in the room affect the ambience of the space, as well as the sound and lighting for both or pre-recorded music/sound. Along with other forms of (non-drug) influences, transformation of consciousness could occur. Thanks for the depth of insight and ideas you are providing us with !! ps: I’ve hosted some living room concerts – its a wonderful experience for everyone and can sometimes provide more income for the artists that they might get otherwise.